En route back to the States from Zurich, we had a brief stopover in Reykjavik, which was cut short a day by a flight cancellation from Geneva to Oslo. Even still, we managed to pack in as much sightseeing as we could in less than 48 hours, and despite bitterly-cold temperatures, Iceland managed to charm and intrigue us. It was indeed the “Land of Ice and Fire”, as portrayed so well in Game of Thrones. We landed at Keflavik International Airport from Oslo at 11:00pm, with the temperature a balmy 15 degrees. Due to confusion between Keflavik (the international airport) and Reykjavik City Airport (the domestic one), we decided on a taxi instead of the city bus, thinking the ride would be five to ten minutes. The taxi sped away into the dark night and soon there were no city lights to be seen, only an 50 kilometer stretch of highway and darkness all around. There are few things as daunting as being in a foreign country with no internet access, no way to check Google maps, and the sound of a rapidly-clicking taxi meter. We could only look at each other nervously, the taxi driver oblivious to our plight. An hour later we arrived in the city center, 16,000 Krona ($120) lighter. Oops. We stayed at an AirBnb in Leifsgata, near the heart of Reykjavik. The population of Iceland is only 323,000 and it’s the most sparsely-populated country in Europe, with two-thirds of its citizens living in or around the capital city. After a restless night’s sleep, we awoke to an icy rainstorm pelting the streets. Our first stop was the famous Cafe Loki, which served traditional Icelandic fare for breakfast. Although the walk was short, the wind was unrelenting, and the icy sidewalks made it difficult to walk. Once seated, we channeled our “When in Rome” attitude as Kara ordered herring on rye bread, and I had an interesting smorgasbord with different kinds of smoked fish and a side of sweet potato puree. It was delicious. The cafe was conveniently located across the street from the Hallsgrimskirkja, an impressive Lutheran church and one of the most famous landmarks in the country. It took forty years to complete construction in 1986, and the church was named after a famous Icelandic poet. In front of the church was a statue of Leif Eriksson, whom we remember from primary school as a Viking explorer and the first European to discover North America. We paid $7 to take a tiny elevator to the very top of the church and looked down on Reykjavik and the colorful houses below. The wind was howling and it felt like the crow’s nest was swaying. 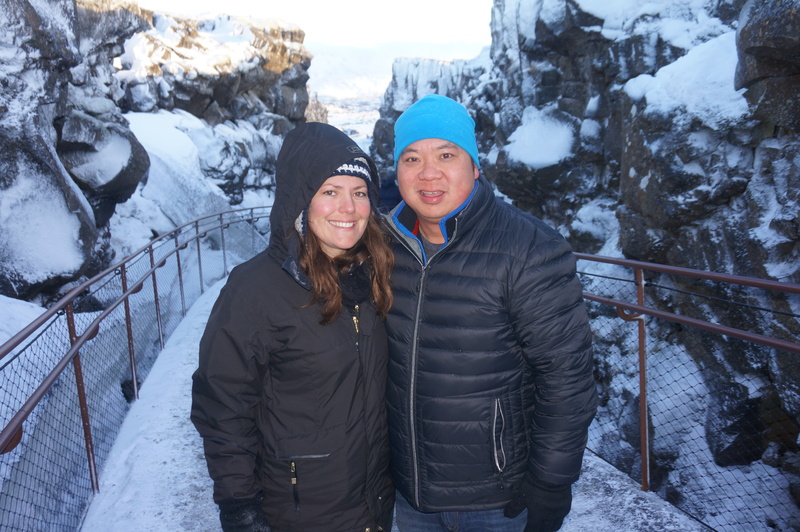 After picking up our Enterprise rental car, we drove to the Blue Lagoon, the most famous natural hot spring in Iceland and also it’s most well-known and popular tourist attraction. It was a 45-minute drive on slick roads heading southwest of Reykjavik. Since we had time to kill before our 5:00pm entrance ticket, we drove through the fishing village of Grindavik. The village felt isolated and empty, but the drive there was certainly interesting. Aside from the sheer incredulousness of being in Iceland (can you believe it?! ), there was nature that we hadn’t seen before. We stopped to take photos of the expansive landscape of volcanic terrain, as well as a pair of beautiful Icelandic horses. I’m not sure what it was like ten or twenty years ago, but nowadays the Blue Lagoon has been Disney-fied, complete with expansive gift shop, spa treatments, pre-booked time slots for entry and an overpriced restaurant. They are even adding a 5-star hotel that will be completed in 2017. Even so, the Blue Lagoon was an amazing, once-in-a-lifetime experience. We spent nearly three hours soaking in the waters, which apparently have a restorative effect on the skin. Walking the ten feet from the warmth of the locker room to the freezing outdoors before jumping into the warm pool was both exhilarating and invigorating. It was raining lightly but it really didn’t matter to us, or to the hundreds of others in the pool. We ordered drinks at the swim-up bar and reveled in the warm water. Amongst our fellow revelers were those from China, Korea, the UK, the U.S. and Europe — making it the United Nations of spas. To make it more surreal, there was a constant mist hovering around us due to the temperature difference between the water and the air. There we were, in swimsuits wading comfortably in the middle of an Icelandic hot spring, icy rain falling on us, surrounded in misty fog. I remembering thinking it felt like being in a dream. After the Blue Lagoon, we drove back into Reykjavik and had dinner at Snaps, which served excellent North Atlantic salmon and had a great ambiance. It was the kind of bistro that would not seem out of place in Brooklyn or San Francisco. We then walked over to Hotel 101 and had drinks with our close friend AnnMarie, who just happened to be in town from New York. Apparently Reykjavik is only a four-and-a-half hour flight from JFK, which makes Iceland closer to New York than San Diego. The next morning, we left Leifsgata. As I packed our things in the car, Kara scrapped ice off our windshield, and it certainly didn’t feel like Southern California. It was 9:30am and still dark outside, and there was no sign of the sun. 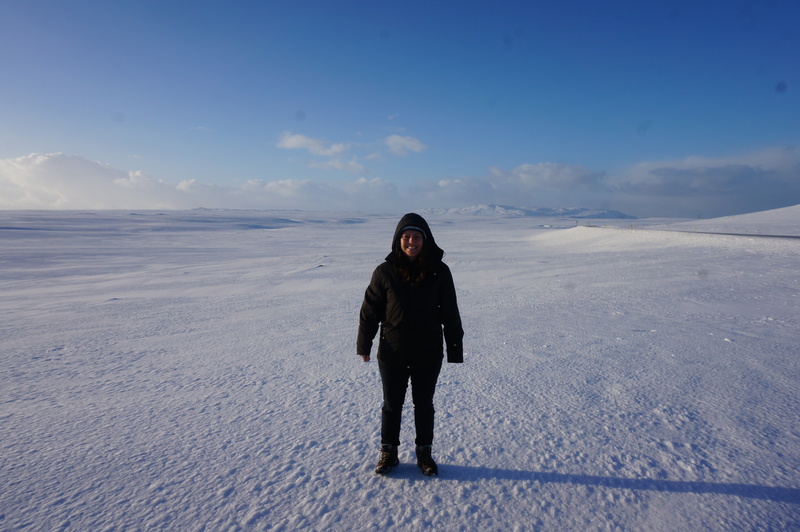 We drove toward Thingvellir National Park, a place where the North American continental shelf hits its European counterpart and you can literally walk in between two continents. Along the way, we stopped to take photos of the stunning scenery, despite the biting, numbing cold. About thirty kilometers from the park, the wind picked up and began to blow the snow all around us. Suddenly our visibility disappeared and we could barely see five feet in front of the car. I pulled off to the side of the road, but buses and other 4X4 vehicles passed me and kept going, so we bravely forged on. Cautiously, I drove around 10 MPH, hazards blinking and windshield wipers working furiously to clear away the snowdrifts. It reminded us of a similar situation a year ago when we drove from Dubai to Abu Dhabi and got caught in a sandstorm. It was scary, alone and snowblind in the middle of Iceland, and I kept thinking we were going to be buried by an avalanche any second. 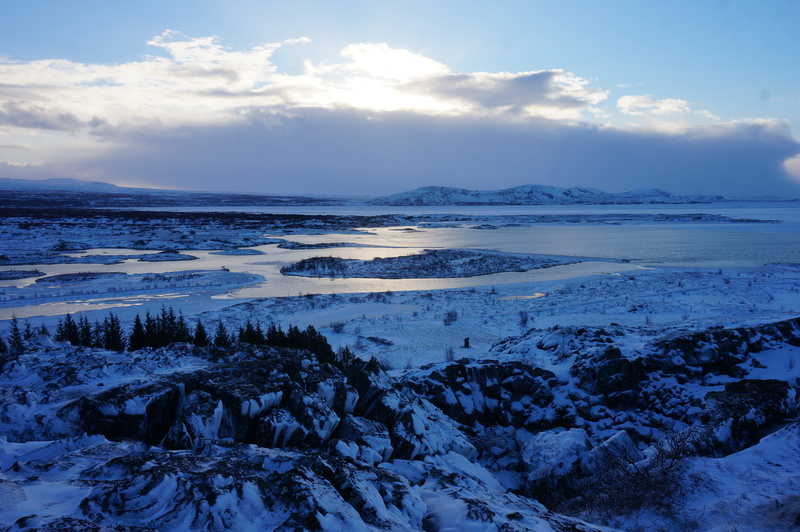 I contemplated turning back but fortunately Kara coaxed me to keep driving to Thingvellir. As soon as we made it to Thingvellir, the windstorm stopped and the sun came out, as if someone dramatically pulled back the drapes to let the light in. We pulled the car in a parking lot with a number of tour buses, and suddenly we were surrounded by hundreds of tourists. It was yet another surreal Iceland moment, going from driving slowly on a snowy, wind-swept highway with no one around for miles to the parking lot of a major tourist attraction. We were glad to have pressed on. Thingvellir was simply incredible. We walked down the path separating the two continental plates, and on both sides were jagged volcanic cliffs. When the wind was blowing, it must have been zero degrees and we were freezing, but the 1 kilometer walk was well worth it. The contrast of the frozen lake, the pure white snow and the black rocks with the sun shining on it all was a sight to behold. 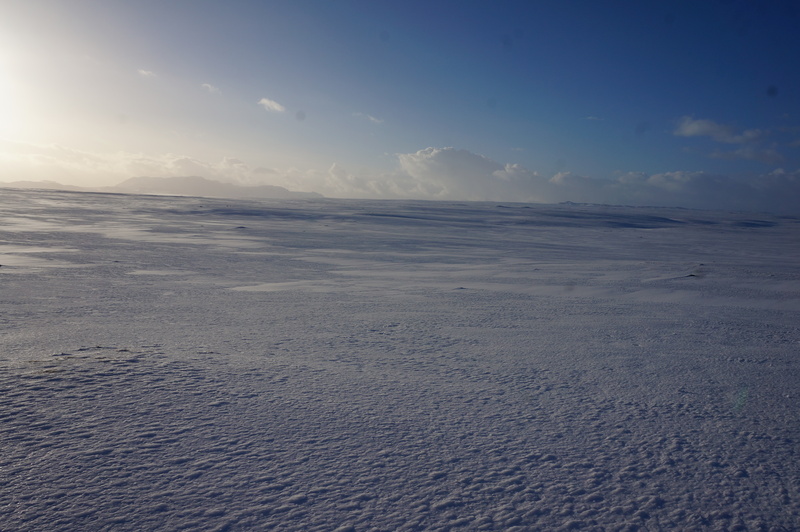 On the way back to Reykjavik to drop off the car and take the bus to the airport, we stopped once more take photos, this time on an expansive open plain filled with snow. It was like being in the South Pole. We marveled at the wide-open snowy landscape and pondered when the next time will be when we’ll see such an amazing sight. It was a nice way to say goodbye to Iceland, but in two days we became certain of a return trip, as there was so much we hadn’t seen. Next time we will come in the summer, do some long hikes, camp near waterfalls and stay out in the midnight sun. This trip was just the tip of the iceberg.